Kelly Reichardt is a director whose filmography is made up entirely of movies that are textbook examples of “slow-burn”. You don’t go in expecting much to happen, and when it does it’s usually very understated and with such little pizazz that those with a small patience will be bolting out the screen door about halfway through. However, Reichardt usually makes up for it by having her films be subtle, quiet-as-a-dormouse character studies that, while certainly not for everyone, will certainly spark several conversations and debates amongst its audience members about its selected themes. Her latest film, Certain Woman – a composite adaptation of a few short stories by author Maile Meloy – is exactly what people would expect from her by this point, although this one arrives with a little more fanfare to UK cinemas, especially after it was awarded the Best Film prize at last year’s London Film Festival. Even so, expect niche audiences to eat this up like they have done with her many other films in the past, from Wendy and Lucy to Meek’s Cutoff to Night Moves; as for me, I admired what the film was setting out to do, but in the end I have my personal gripes with it that prevent me from really loving it. Basically, the plot – in the very loosest of terms; I’m not joking around when I say that not much happens during this film – is three separate storylines about a few women in Montana going about their normal everyday lives and the light episodes that occur within them. The first story sees Laura (Laura Dern), a laywer, try and handle her increasingly unstable male client (Jared Harris), especially when he instantly accepts the same advice she’s been giving him when he hears it from a male colleague. The second sees wife Gina (Michelle Williams) try and negotiate with an elderly gentleman (René Auberjonois) about selling her his pile of sandstone for a house she’s building, although he’d much rather talk through her all but useless husband (James LeGros). Finally, lonely ranch hand Jamie (Lily Gladstone) starts attending night classes, only because she’s fascinated by the young, underprepared teacher Beth (Kristen Stewart), who herself is exhausted from the constant four-hour night-time journey between jobs. Aside from one or two plot intersections, like a character that’s revealed to be having an affair with one of the main characters, these stories are kept virtually separate from one another, like a trio of short films spliced together to make a feature-length one. However, when you break each individual story down, you find that they share similar themes of suppressed womanhood and loneliness. Laura is personally undermined during her client’s male-centric second opinion, while at the same time she struggles to connect with her lover who doesn’t really stick around to engage in conversation; Gina constantly feels belittled by her well-meaning but simple-minded husband and lazy teenage daughter, and in her personal determination to get what she wants manages to also isolate those around her; Beth feels like she’s always put on the spot with her teaching assignment and thus can’t feel like she’s doing a competent enough job; and Jamie especially yearns for any kind of human connection, if only to keep her sanity after looking after horses all day long. They may seem like separate characters and stories, but they are all tied together by some interesting themes, something that Reichardt manages to do with some gently poetic landscape imagery and miniscule but identifiable situations and characters. However, the reason I don’t personally love this film as much as a lot of other people do is that, quite frankly, it is perhaps a bit too much of a slow-burn for my own tastes. There are parts of this movie where it definitely feels like it’s dragging, and so it tends to test the patience a little bit while you’re also trying not to fall asleep since nothing much is happening. I do enjoy slow-burn movies, and I appreciate what this film was trying to do, but I’m not sure this was really my thing. If you’re the kind of person who lives for this kind of quiet, understated slow-burn then you’ll probably get more of a kick out of it than me, but again I’m glad I saw Certain Women at least once, if only for the interesting, though overly slow, themes it was hinting at. 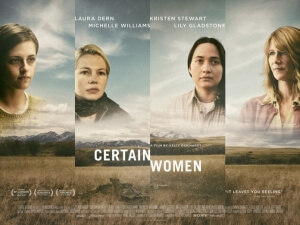 Certain Women certainly raises some interesting themes and characters, which filmmaker Kelly Reichardt manages to tie neatly together with some nice landscape cinematography, but its overbearingly slow-burn pace might tend to test people’s patience a little bit, coupled with its light narrative that doesn’t make it a film for niche audiences only.